Do you have a dingy-looking porcelain sink, tub or toilet? Maybe when your plumbing fixtures were installed, pink or blue toilets and sinks were all the rage. Taking out an old toilet, sink or tub often means damaging the nearby tile or counters. If you aren't ready to remodel the entire bathroom but just can't live with the current state of your fixtures, consider paint. Covering the fixtures with a coat of paint can completely change the look of your bathroom with very little expense. Paint your tub shiny white. Clean the fixture thoroughly with trisodium phosphate (TSP). 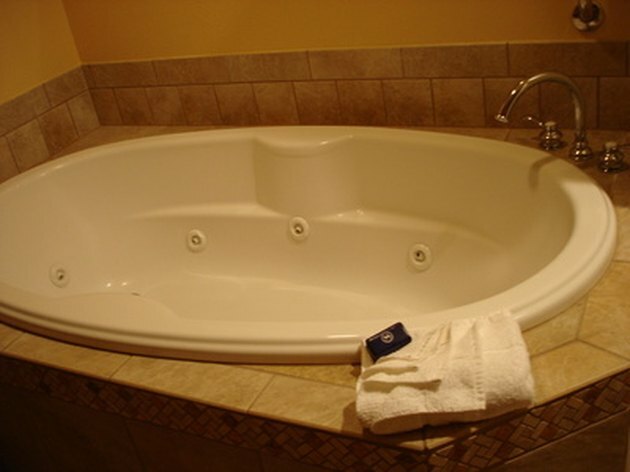 TSP will remove all of the soap scum and grime from the tub or sink and will also dull the shine. This will help the epoxy primer better adhere to the porcelain. Sand the plumbing fixture thoroughly. Use a palm sander and medium-grit sandpaper for a more uniform finish. Sanding will create some texture for the primer to sink into and will also smooth out chips in the porcelain. Remove the medium-grit sandpaper and replace with fine-grit paper. Sand the entire tub, sink or toilet to create a perfectly smooth surface. Wipe off the sanding dust with a damp rag. Wipe on a coat of bonding agent with a paper towel. Apply a light coat of bonding agent and allow the chemical to dry for 5 minutes. Apply epoxy primer to the porcelain. Avoid visible brush strokes by applying thin, even coats of primer. Paint with a good quality brush and move the brush in one direction. Allow the first coat to dry. Sand the tub, toilet or sink with fine-grit sandpaper. Use light pressure to gently buff out any scratches. Wipe off sanding dust with a damp rag. Paint on a second thin coat of epoxy primer. Allow the primer to dry and evaluate for scratches. Sand any scratches with fine-grit sandpaper. Apply a coat of acrylic topcoat to the sink, tub or toilet. Use a good quality paintbrush and work in one direction. Apply two to three thin layers of topcoat, allowing each coat to dry completely before applying the next. Let the plumbing fixture cure for 7 days before heavy use.